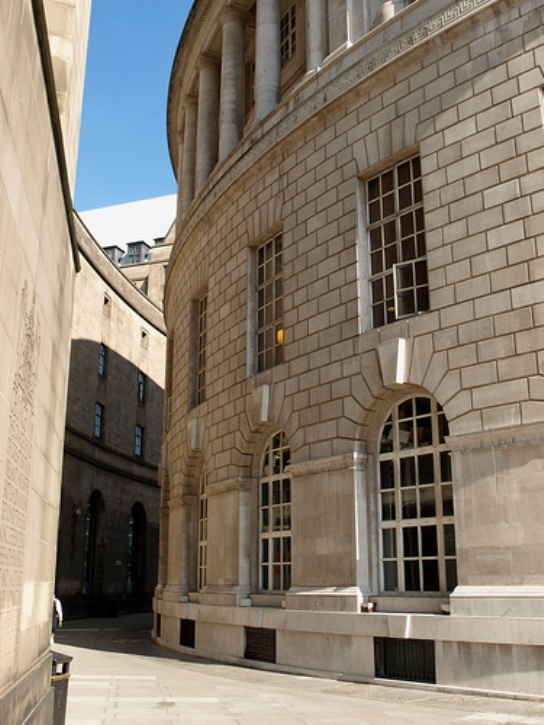 Anyone who has spent time in Manchester will no doubt have come across the Central Library, and in doing so one of the finest little spaces that this or any other city has produced – Library Walk. Nestled between the Library and the Town Hall, the gently curved street sort of links St. Peter’s Square and the Town Hall and is one of those little spaces that the produces a small sigh of content whenever you walk down it. Now, the Central Library is currently undergoing significant works to modernise it, and St. Peter’s Square is also due radical change as part of the planned expansion of the Metrolink. Both of these are more than needed, the first to bring the Library up to modern standards in terms of protection of the books (the fine façade and reading room are to remain unaltered) and the Metrolink to make it a more viable form of transport in the city. However another Planning Application has also been submitted to put a glazed roof on Library Walk and more worryingly gated access – this will effectively privatise Library Walk. The application is still at the stage when the public is allowed to comment on it, and you do not need to be a resident of Manchester in order to do so. Detail of the application can be found here. Or through the Planning Portal System (the same link). The application was made on the 14th May 2012 which by my rough calculation you would have until the middle of July to raise any concerns. – That by creating gated access to Library Walk, access will be limited to the street and could be denied on occasion. The street will no longer be accessible twenty four hours. – The street forms a distinct and unique part of the Manchester landscape, in no other part of the city is there anything like it and the proposals would ruin its unique character. – A glass roof would ruin the existing synergy between two sensitive buildings, in particular the nature of how the streetscape is affected at different times of the day. – The existing entrances to both the Library and the Town Hall will be relegated to secondary status. Unfortunately you can’t access Library Walk at the moment due to the renovation works at the library, and I suspect the application has been made at this stage in order to prevent people from being able to do so. So please, remember this fine little space, and if you feel like it let the council know your views on the matter. Long have I suspected it, but this weekend we found conclusive proof that the insidious tendrils of his dread cult have reached the shores of England. We were invited to spend the day in the grounds of Chatsworth House, a dwelling of not inconsiderate size which was also home to the Duke & Duchesses collection of art & curios from around the world. The day proved a pleasant enough distraction from the weather that has plagued us of late, and collection he and his ancestors had amassed was indeed impressive. Back from a few days up in Edinburgh in the company of Sj for the weekend in order to catch the start of the Fringe. Good weekend, apart from the sheer length of the journey there and back (the A702 just eats time over what should be a half-hour journey). Some good stuff seen, one spectacularly bad thing and a good weekend in all. I was trying to discuss this last night with C but without actual examples it’s pretty hard to have the discussion. So here goes, even if you don’t particularly like Obama you’ve got to admit that he’s got better Graphic Designers working for him. Whether he’s actually got an eye for design himself is debatable, but someone on his staff certainly does and his campaign posters are better by a country mile. The problem with all speculative fiction is that it sometimes can become fact – or at least make the move towards it in a way that both amuses and disturbs in equal measure. Author midlandfilmmonkeyPosted on 2007/06/05 2012/03/20 Categories life stuffTags art, politicsLeave a comment on Only Citizens Can Vote!